The airport at Bellingham rests in a remote area far north of Seattle. The local residents appreciate being away from urban clamor. So, when Allegiant Air started scheduled air service using older, noisier MD80 jets, it created a backlash. Subsidies from the airport authority to aid airline marketing also drew complaints. A substantial number of passengers drive all the way from the Vancouver area to avoid paying airfare taxes that support the Canadian ATC system. Allegiant flies older MD80 models, considered to be the noisiest passenger jet in use in the U.S. An additional aviation noise problem comes from Navy jets that fly to the airport from NAS Whidbey and do pattern work. Other than these two noise sources, the airport is low-key and coexists well with the local community. In fact, as with most U.S. airports, total activity (which is mostly general aviation) has been steadily declining for more than a decade. Airport operations are controlled by a contract control tower. The airport is located midway between Ferndale and the downtown area of Bellingham. The main freeway, I-5, passes near the north end of the runway, while the south end is minimally developed and not far from the bay. The two older, diagonal runways (left over from the airport’s early history as a training base during World War II) have been closed. 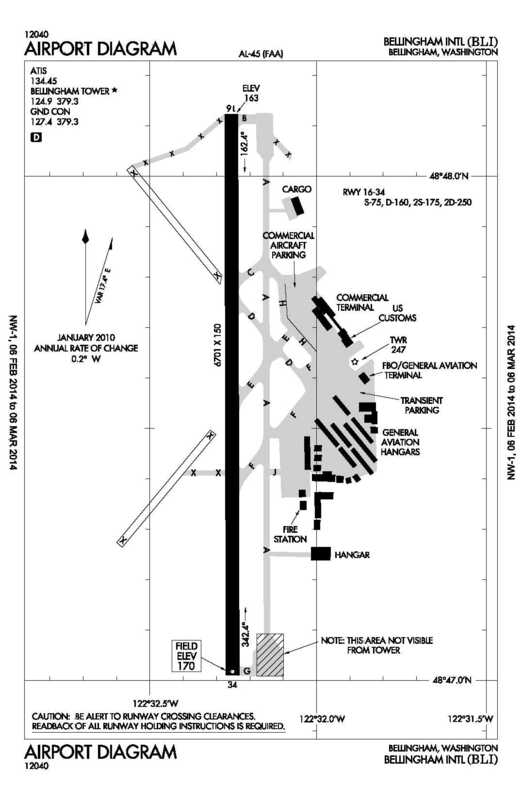 Thus, all operations are conducted on the one north-south Runway 16-34. 3-25-2013 — Bellingham airport officials ask local travelers to get a ride, rather than park. Busiest time of year is Spring Break. The parking lots fill to capacity, so airport officials are asking locals to get dropped off at the airport. Comments include some locals who are not happy that Canadians are filling the parking lot, while locals are asked to stay away. One suggestion was, why not try to set up shuttles for the Canadians, such as to park-n-rides at Blaine or elsewhere, so they can drive less and use up fewer parking spaces. 1-24-2013 — Bellingham Airport Advisory Group will meet. Guests are invited. Meeting to be held at 9:30AM on Thursday, at the GA Conference Room, 4201 Mitchell Way. The webpost lists agendas, AAG members, etc. 1-15-2013 — Bellingham airport remains in growth mode. Article says 571K passengers flew out of BLI in 2012, and more flights are expected in 2013. Also, Allegiant plans to replace its MD80’s with quieter A319’s. 12-7-2012 — Flight museum expects to leave Bellingham over disputed lease. The Port interprets FAA grant obligations as requiring a higher lease rate. Additionally, Heritage Flight Museum Executive Director Greg Anders believes Port officials reneged on promises made eleven years, when the museum came to Bellingham. 12-5-2012 — Paine Field wins FAA’s Approval for Commercial Airline Flights. A decision with possible implications for passenger demand at BLI. 12-4-2012 — Bellingham Welcomes B.C. Flyers. The online copy is posted at the Montreal Gazette and includes a news video with Ted Chernecki, explaining the larger issue of U.S. border airports drawing Canadian passengers to fly out of U.S. airports.